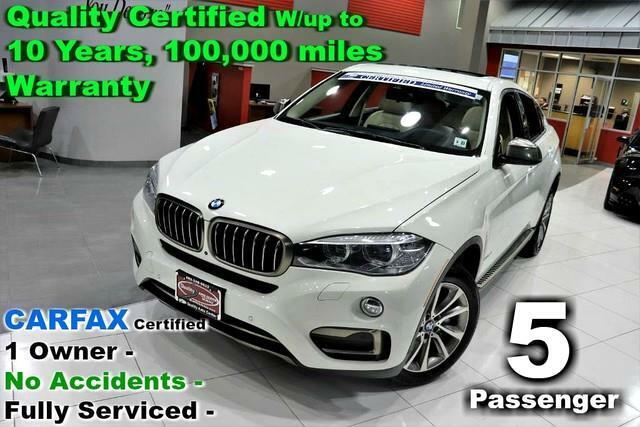 5 Passenger Fully Loaded - CARFAX Certified 1 Owner - No Accidents - Fully Serviced - Quality Certified W/up to 10 Years, 100,000 miles Warranty 2016 BMW X6 xDrive50i Sport -. This BMW includes: LIGHTING PACKAGE Fog Lamps Daytime Running Lights ALUMINUM RUNNING BOARDS Running Boards/Side Steps COLD WEATHER PACKAGE Heated Rear Seat(s) Heated Steering Wheel DRIVER ASSISTANCE PLUS Lane Departure Warning Back-Up Camera Blind Spot Monitor SMARTPHONE INTEGRATION Bluetooth Connection Auxiliary Audio Input MP3 Player PARKING ASSISTANT Automatic Parking SURROUND VIEW Back-Up Camera *Note - For third party subscriptions or services, please contact the dealer for more information. * This BMW X6 has been loved by its original owner as CARFAX shows it to be a one-owner. Treat yourself to an SUV that surrounds you with all the comfort and conveniences of a luxury sedan. Sophistication & understated luxury comes standard on this BMW X6 xDrive50i Sport -. Well-known by many, the X6 has become a household name in the realm of quality and prestige. When the BMW X6 xDrive50i Sport - was created, it was automatically enhanced by having the performance ability of all wheel drive. Not only will you notice improved steering and superior acceleration, but you can also rest easy knowing that your vehicle comes standard with increased stability and safety. Low, low mileage coupled with an exacting maintenance program make this vehicle a rare find. Added comfort with contemporary style is the leather interior to heighten the quality and craftsmanship for the BMW X6 You'll see the world in a whole new way thanks to the navigation system that comes with this vehicle. The easiest choice in purchasing a new vehicle is choosing one with a complete and detailed history like this gently driven pre-owned vehicle. Beautiful exterior. Clean interior. This BMW X6 is so immaculate it is practically new. Unexpected repairs happen on all vehicles, but this BMW X6 comes with the protection of the manufacturer's warranty. Stupendously fast, yet subtle at the same time, this BMW X6 xDrive50i Sport - sets the bar high. A true automotive masterpiece, this BMW can function on track-day or work-day, and will always get you to your destination very quick. This wonderfully appointed vehicle comes equipped with the options and features every driver craves. This car enjoys a laser-perfect paint finish. This incredibly rare BMW X6 xDrive50i Sport - is a work of art and is the type of vehicle a true automotive aficionado will appreciate for a lifetime. This BMW X6 xDrive50i Sport - has high-end wheels to enhance your ride and the overall appearance of this vehicle. More information about the 2016 BMW X6: The BMW X6 is a luxurious SAV, which is BMW-speak for Sport Activity Vehicle. In other words, the X6 is more about driving enjoyment and luxury than pure off-road prowess and the ability to haul a huge load of cargo. Starting at around $60,000, the X6 is priced like the luxury vehicle it is. But in exchange, it offers huge amounts of fun, decent practicality and unique, sporty styling. This model sets itself apart with Attractive, coupe-like styling and decent ground clearance, luxurious interior, powerful engines No Credit / Bad Credit / No Paystubs, No problem !! ! All Approved ! Everyone drives ! CLEAN, GORGEOUS, LOW MILES, SHOWROOM CONDITION. CALL NOW QUALITY CERTIFIED up to 10 YEARS 100,000 MILE WARRANTY , To Certify a vehicle, there will be an additional cost for Certification. CALL NOW For details. STUNNING AGGRESSIVE LOOK ON THIS BEAUTIFUL--Call today to schedule a test drive... Good Credit/Bad Credit/No problem!!!! Get paid cash? No problem!! 100% Credit Approval with interest rates starting at 2.49% for qualified customers, our rates will not be beaten. We price our cars at wholesale price to guarantee the best deals for our customers. Our inventory moves quick, please call to confirm the availability of the vehicle of your interest Springfield location 973-564-0112. This vehicle is located at our SPRINGFIELD location. Come visit our new showroom in Springfield NJ. This 2016 BMW X6 xDrive50i is offered to you for sale by Quality Auto Center. This SUV is a superb example of what a tough, work focused vehicle should be. Exceptional towing, acceleration and torque will help you get the job done. There's a level of quality and refinement in this BMW X6 that you won't find in your average vehicle. Simply put, this all wheel drive vehicle is engineered with higher standards. Enjoy improved steering, superior acceleration, and increased stability and safety while driving this AWD BMWX6 xDrive50i. Exceptional in every sense of the word, this incredibly low mileage vehicle is one of a kind. More information about the 2016 BMW X6: The BMW X6 is a luxurious SAV, which is BMW-speak for Sport Activity Vehicle. In other words, the X6 is more about driving enjoyment and luxury than pure off-road prowess and the ability to haul a huge load of cargo. Starting at around $60,000, the X6 is priced like the luxury vehicle it is. But in exchange, it offers huge amounts of fun, decent practicality and unique, sporty styling. This model sets itself apart with Attractive, coupe-like styling and decent ground clearance, luxurious interior, powerful engines No Credit / Bad Credit / No Paystubs, No problem !! ! All Approved ! Everyone drives ! CLEAN, GORGEOUS, LOW MILES, SHOWROOM CONDITION. CALL NOW QUALITY CERTIFIED up to 10 YEARS 100,000 MILE WARRANTY , To Certify a vehicle, there will be an additional cost for Certification. CALL NOW For details. STUNNING AGGRESSIVE LOOK ON THIS BEAUTIFUL--Call today to schedule a test drive... Good Credit/Bad Credit/No problem!!!! Get paid cash? No problem!! 100% Credit Approval with interest rates starting at 2.49% for qualified customers, our rates will not be beaten. We price our cars at wholesale price to guarantee the best deals for our customers. Our inventory moves quick, please call to confirm the availability of the vehicle of your interest Springfield location 973-564-0112. This vehicle is located at our SPRINGFIELD location. Come visit our new showroom in Springfield NJ.